← Where Has Justice Gone? I know for a fact that I’m on at least 2 of them; probably more. Let them watch me, it means I’m doing my job as a Patriot exposing the corruption and tyranny of my government. As Patrick Henry said, “If this be treason…make the most of it.” I consider it a badge of honor to be considered a criminal by those who are the real criminals in this country; our government. So let them watch me, add me to their lists. I bet if Patrick Henry, Thomas Jefferson, and Samuel Adams were alive today their names would be on those lists too. So if I’m on their lists, I’m right where I belong…among past and present patriots. 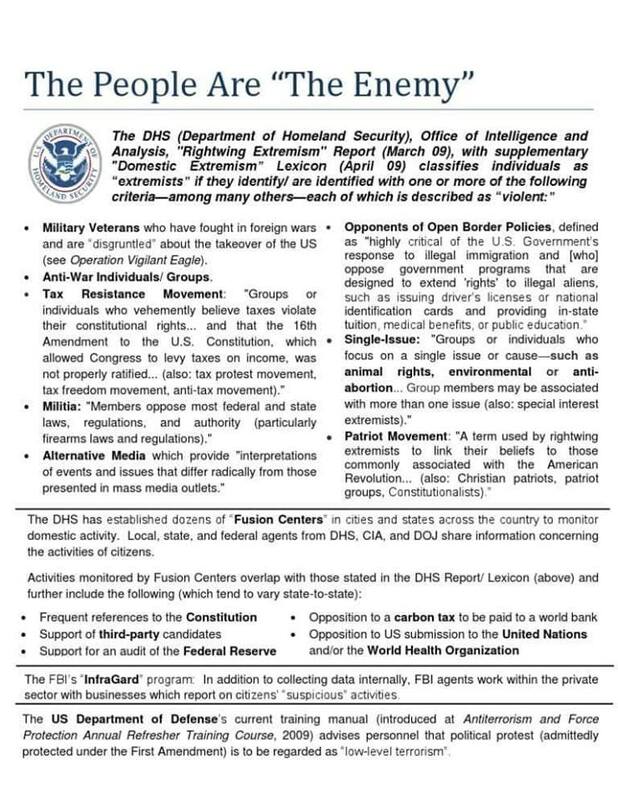 3 Responses to Are You An Enemy of the State? how does one discover if they are on “the list” ? How do we know if were on any list or if were being watched specifically? Who wrote this ? Who’s eyes is intended for ? How did it come to be made public ?